Total Texture! Make This Slouch Hat Now	Classic striped crochet hat – make it now! What’s black and white a cute all over? A panda bear! From their roly-poly bodies to their perfectly round ears to their black-rimmed eyes, pandas charm with their appearance and antics. But this Bear-y In Love Panda Amigurumi is special, because he (or she) only has heart eyes for you. Can’t you just see this precious panda perched on your desk—or the desk of someone you love—beaming love with every look? Young ones will enjoy waking every day to find this amigurumi friend welcoming them from their bedside table. It’s so easy to make this little crochet doll. The Bear-y In Love Panda Amigurumi is worked in the round, from the top down. You work the head and body in one piece, stuffing the amigurumi with fiber fill as you go. The ears, arms, and legs are worked separately and stitched onto the head and body. Those loving eyes are cut from felt and glued on, and then you sew on the nose and brows with embroidery thread. Designer Jackie Laing loves to make amigurumi, and she created this pattern—and several others—for I Like Crochet. Be sure to check out her lion, bunny, and candy amigurumi, too! What a wonderful gift this loving panda would make for someone special—a young person, your significant other, or a best friend. 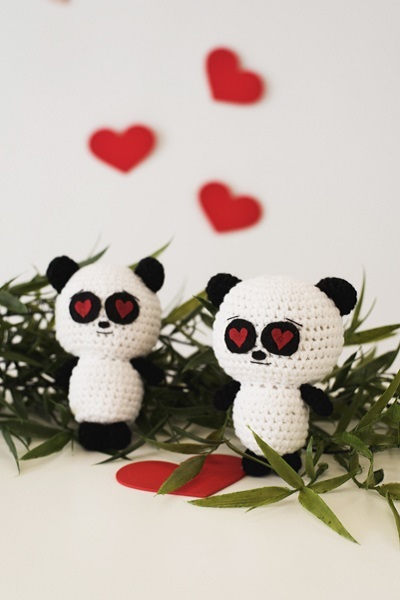 The Bear-y In Love Panda Amigurumi is the perfect way to say I love you bear-y much! This pattern is included in the February 2018 issue of I Like Crochet. And guess what? You can access it anywhere you go! Just become a Gold Club Member, and you’ll be able to view this crochet amigurumi pattern on your laptop or tablet – whichever device you prefer! Of course when you become a Gold Club member, you’ll also get stitch tips and tutorials, and don’t forget … 600+ patterns for everything from scarves to afghans! And you can take all of it with you wherever you want to crochet – at home, on the road, at the big game … it’s your choice!